Looking for a credit card offer that’s like none other on the market today? Something that gives you more bang for your buck and more options than you can even imagine? Then the Williams Sonoma Visa Signature credit card just might be what you’re looking for. This week, we take a look at this co-branded credit card that’s issued by Barclays Bank. First, the logistics. Your credit must be strong to garner an approval for this credit card, but once you do, the bonus points, perks and other benefits are noting short of remarkable. You’ll enjoy a 0% intro APR for your balance transfers and there’s no annual fee. After your first purchase, you’ll earn 2,500 bonus points that you can instantly redeem for a $25 gift card if you’d like. The First Use Bonus Award works like this: Card members will receive a one-time bonus award of 2,500 points if a purchase posts to their account (provided the transaction is not later rescinded or returned) after the account is opened. These bonus points are posted at the close of the first billing statement after the qualifying purchase is made. Three rewards points for every dollar spent at Williams-Sonoma and one point for every dollar spent everywhere else Visa is accepted. The gift cards you’ll earn on occasion can be given to friends and family or you can use them for your own. Gift cards may be used for purchases at stores, online or on the phone. Even better, they can be used in not only Williams-Sonoma stores, but Pottery Barn, pottery barn kids, PBteen, and west elm too. Statement credits are given to pay for Williams-Sonoma purchases, free shipping and bonus coupons are just a few more ways you’re going to save money with this credit card offer. Note with the free shipping offers, the restrictions: As a card holder, you will receive complimentary standard shipping on all eligible online purchases at Williams-Sonoma. 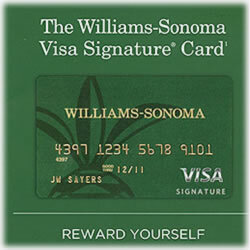 This is applicable during the first 12 months and requires the use of your Williams-Sonoma Visa Card. A promotion code and instructions to enroll in this benefit will be sent to you in the mail with your new credit card. Already a Reserve member? No problem – you’ll receive a one year extension to your already existing Reserve membership. Keep in mind the free standard shipping for the first year is subject to the terms and conditions. Carefully review those terms and conditions so that you understand the details, limitations and restrictions. In no event are Coupons or any part thereof convertible to cash or cash equivalent. Coupons shall have no cash or monetary value. Coupons may not be used to pay off or pay down any Barclays Account. Other perks include custom concierge, 24/7 personalized global assistance with dining, travel, tickets and more. Bridal Bonuses allow you to earn 3 points per dollar on gifts purchased from your Williams-Sonoma Bridal Registry, provided you have made a qualifying purchase on your Williams-Sonoma Visa and provided its linked to your registry account. You’ll enjoy the the online management system, too. You can manage your account, redeem your rewards, claim your gift cards and a host of other options. There are a few things to keep in mind. Your benefits will vary depending upon the card for which you are approved. Not only that, but not everyone will qualify for the Visa Signature Card and its benefits. In those instances, if you don’t meet the credit criteria or if your income doesn’t meet the threshold, you could be offered a Visa Platinum Card, which has fewer benefits. Founded in 1956, this company quickly became the “premier specialty retailer of home furnishings and gourmet cookware in the United States”. Its many brands are considered the best in the industry and the name and everything it symbolizes is a powerful player in not only the American sectors, but on a global level as well. It offers the highest quality and most stylish products for every room in your home. It makes perfect sense that it would partner with a credit card company to make its offerings that much more affordable. Whether it’s the kitchen, the living room, the bedroom or the home office – and even the hall closets, Williams-Sonoma remains the first choice for millions of consumers. More than five decades later, this store has grown from a small French cookware retailer to a conglomerate that continues to provide its customers the highest quality products from around the world. With more than 250 stores around the nation as well as a full service ecommerce site, the company remains committed to its customers and its strong dedication to quality. In recent years, the major retailer has been a strong supporter of the No Kid Hungry campaign and has dedicated many resources to ending child hunger in the U.S.
Barclays PLC is one of the world’s oldest and certainly largest financial entities. With more than 300 years experience, this major financial player moved more than $57 trillion in global economies. In October, Money Magazine named Barclays a “2012 Best Bank” for savings accounts. The bank cites its industry-leading rates and for having “no-fuss products” that are minus maintenance fees and minimums.